HELLO AMERICA! I must admit once learning that writer, filmmaker DANIEL GROSS was also an alumnus of U.S.C., where I had my beginning years before, I immediately was interested in his view of the book by a mutual friend SOFIA LVSH. Once reading Gross’ review I contacted him asking if I might republish it in my column with the Canyon News. He immediately consented making me extremely happy and proud that a fellow U.S.C. family member displayed such a wise and tense awareness of a work of the heart much needed in our wandering, searching and confusing world we maintain today. Those of you out there who might enjoy subtlety, quiet genius with a sharp dash of hard reality, please take time to read this review of the SOFIA LVSH master work “Passion of the Illuminati”. THIS EXCERPT is for all of you. Religion, especially in the incarnation of a cult, can be a very strange and dividing concept; it often has been, and may always be. Our modern world is clearly no exception to this, as most current books about religion are meant to illustrate and defend the enlightenment and freedom that comes with fervent belief…but, on the other hand, there are also a great many books meant to identify and censure the hypocritical cruelty of religion that could hurt others. I’m pleased to say there is now one particular author, fresh on the European literary scene, who is currently adopting a bold, refreshing stance on religion which does not take one side over any other. Her debut novel instead tells a compelling, multi-layered, and tonally-diverse story that attributes religious capabilities to fate, heritage, niche, and concentrated mindset alone. This author goes by the enigmatic name of “Sofia Lvsh”. 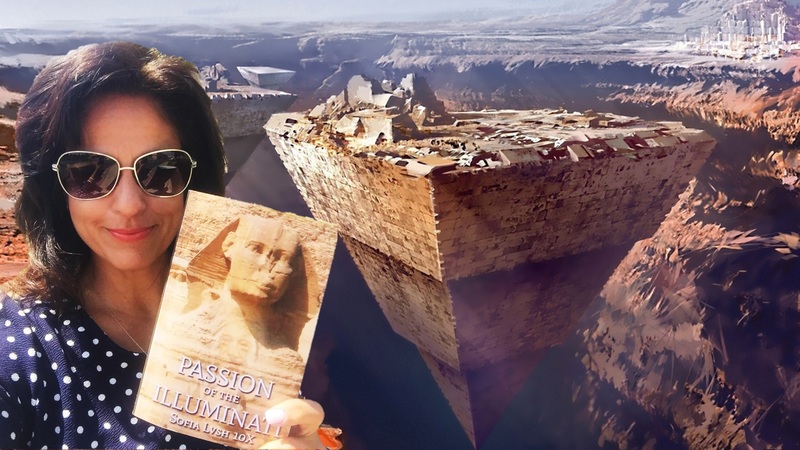 Her story is titled “Passion of the Illuminati”, and it is not what you may think upon examining the Travelogue-esque cover and synopsis. It may also seem at first glance like a Dan Brown story (and, on some level, it is)...however, the first third of the book flows like a heightened, darkly-funny version of "Eat, Pray, Love", with all the sensuality that entails, before religion even enters into the equation. We find ourselves immersed in the tale of a fiercely-insightful young woman named Sabine, who is every inch the main character of this story. She rapidly cycles through many acquaintances of hers all across Europe, who each face personal/relationship/sexuality dilemmas that only Sabine can help solve (in-between her upscale "client meetings" as a businesswoman). She also endures her own personal “dramas of errors”, particularly during a trip to Mexico, and encounters some impoverished people who could stand to gain a pearl of wisdom or two. Now, we enter the second third of the story, which gradually ramps down in its complexity as Sabine stumbles across a mysterious young man, who claims he is not only part of a powerful family dynasty (with political and societal influence to bear), but also a member of the mystical "Illuminati" movement. She finds herself being swept into love with him for the very first time in her life, as she accompanies him on many of his lavish retreats with Illuminati royalty. However, this love affair eventually causes her great angst and confusion, as everything down to her bloodline, her personality, and her friendships are disrespectfully called into question by him…and she, in turn, questions the honesty and nobility of his legacy and worldview, as well as his ultimate reasons for wanting to be with her. And, finally, the concluding portion of the book is increasingly reminiscent of authors like George Orwell and Stephen King. Sabine, through many interactions with others, gradually comes to realize a highly-overwhelming fate for herself, which was evidently predestined long before her birth. Is this fate of hers a good or bad fate? The answer is…you'll just have to order the book and find out. Thanks so much! :) I definitely hope we can correspond more after this email, because Sofia says you're a very interesting, kind, and accomplished man...have a wonderful rest of the day!